The La Mesa Depot Museum is La Mesa, California’s oldest building in its original form and is the sole surviving San Diego and Cuyamaca Railway Station in existence. The building you see today on the corner of Spring Street and La Mesa Boulevard in downtown La Mesa has an colorful history. In 1885 the Santa Fe and Southern Pacific Railroads extended service to San Diego. At that time, the locomotives burned coal and access to the wharf to load coal from ships was critical. The section of the San Diego and Cuyamaca Eastern Railway extending through La Mesa Springs was originally planned to join with the Santa Fe or Southern Pacific Railroads at Needles, but, due to the mountainous terrain, never got past Foster, just east of Lakeside. Transportation past that point to Julian was accomplished via stagecoach, at a price thirteen times that of railway travel. 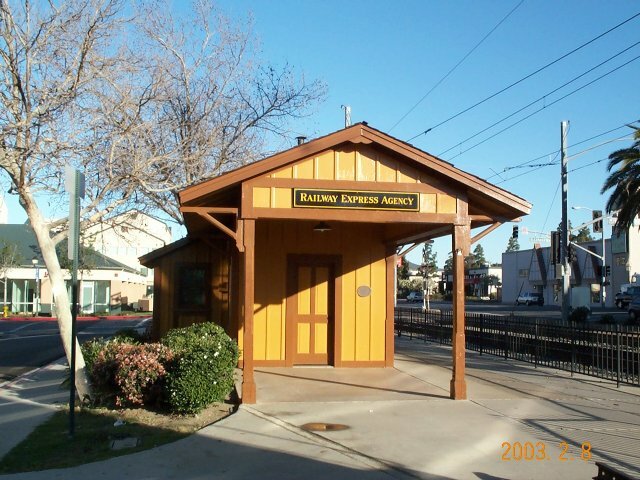 It was in 1888 that the railway came to La Mesa Springs and in 1894 the original station in La Mesa was constructed, its first name being the Allison Station. In 1915, the small original building was moved across the tracks and expanded to its current size. The railway served the residents of the area in a variety of ways and the station was truly the center of town to its people. The City of La Mesa and its environs certainly would not have progressed as far or as quickly without the help of the trains. Students used to commute to San Diego High School for their classes, the alternative being a one-hour ride in a buggy. The many lemon farmers appreciated and took advantage of both their proximity to a railroad and their access to the flume for irrigation. The flume had been constructed in 1887 and brought water down from Cuyamaca Lake. In 1928, passenger service stopped on this section of the what was, by then, a branch line of the San Diego and Arizona Railway. Freight service continued, though several floods and the construction of Gillespie Field for air travel had shortened the end of the working line back to El Cajon by 1943. In 1954 Spring Street was widened and the La Mesa Depot building was sold to the Lakeside Chamber of Commerce for one dollar, to be used as part of a “western town.” The city of Lakeside never used it, and shortly thereafter a woman by the name of Flossie Beadle purchased it and ran an antique store and museum out of the building. After she passed away, the structure was used as a worm farm and chicken coop over the years and fell into disrepair. In 1974, the Pacific Southwest Railway Museum Association located and purchased the remains of the building, again for one dollar. In 1980-1981 the building was returned to its original site and, using money from a federal grant, was restored to its 1915 condition. Preservation was truly a labor of love for volunteers of the San Diego Railroad Museum, with help from members of the La Mesa Historical Society. Today the Railroad Museum owns and maintains the building, and the City of La Mesa owns and maintains the grounds and land beneath it. 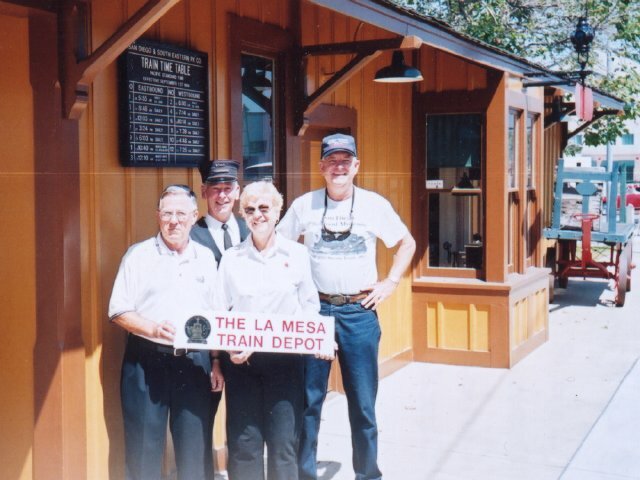 The public is admitted free to the La Mesa Depot Museum for tours on Saturday afternoons from 1PM to 4PM. Visitors can inspect the steam locomotive and string of freight cars on the nearby track and pass through the ticket/waiting area and view the telegrapher’s station and a small exhibit area in the baggage room. This building and its past are a fascinating look at a bit of small-town railroading from yesteryear and its importance to the community it served.